College Graduation Diploma Certificates or University Graduation Diplomas represent the ultimate achievement in a graduate's academic pursuits. College graduation is no easy feat and Gradshop appreciates how important this accomplishment is. With that being said, we have come up with the best stock diploma certificates made from premium quality paper, completed with elegant text fonts to perfectly suit this momentous occasion. 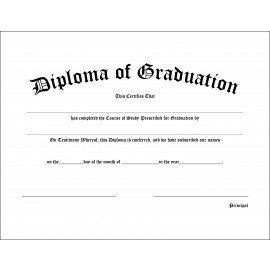 If you need something much more personalized, we also have Custom Diploma Certificates. These come fully customized with all the details and specifications you'd like placed in your diploma like the educational institution's name, the course completed, the institution's seal and others. Get in touch with our friendly staff to find out more!